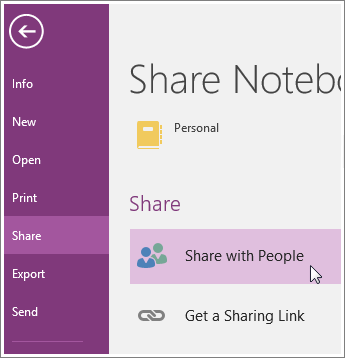 If you'd like to share your notebook with other people, make sure you create your OneNote 2016 notebook on OneDrive so others can get to it. If you've already created a notebook on your computer, first move it to OneDrive. Just because your notebook is on OneDrive doesn't mean people can automatically see it. It's available to you on all your devices. You'll have to deliberately share it with others before anyone else can see it. 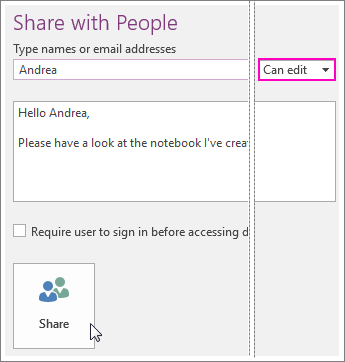 You can invite people to see your notebook with an email message generated by OneNote. Only people who are invited will be able to open your notebook. Under Share with People, type the names or email addresses of people you'd like to share your notebook with. In the drop-down box on the right, choose whether each person can edit or just view your notebook. Add a personal note, if you'd like, and choose Share. The people you've selected will get an email invitation to open your notebook. You can generate a link to your notebook so others can view or edit it. If someone forwards the link to another person, they will also be able to see your notebook. 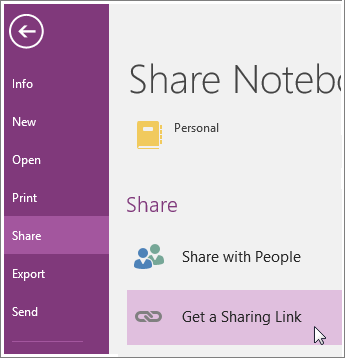 Choose File > Share > Get a Sharing Link. Next to View Link or Edit Link, choose Create Link. Note: If you ever change your mind, you can change permissions or stop sharing your notebook. It will still be on OneDrive so you can get to it on all your devices.